This continuing string of unseasonably warm weather appears to have no end in sight, as next week’s temperatures are forecast to be in the high 60’s and low 70’s as well. Some much needed rain showers should provide some moisture to the already drying landscape this weekend, with another chance of showers toward the end of next week. Again, this weather is very atypical of any week in April, let alone the entire month. The old saying “April showers bring May flowers” may still be true, yet as of today many of our May flowers have begun blooming already despite the significant lack of rain. Well, it’s official: the crabapple trees have begun blooming in the month of April. 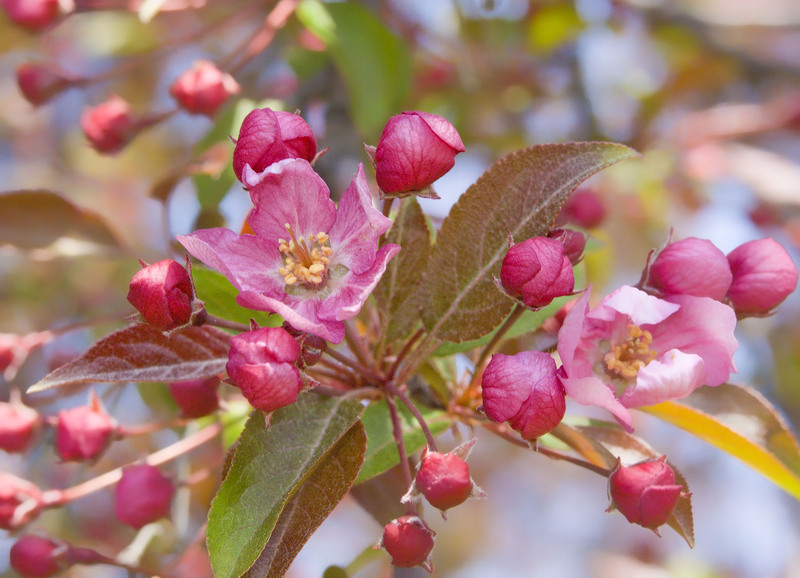 This might be some kind of record, or at least a very seldom-observed occurrence, as crabapple blossoms are one of the most cherished natural events of early May in southern Minnesota. And it’s not just the crabapples; american plums, highbush cranberries, and even our lilacs have also begun blooming. A look around the arboretum reveals a landscape reminiscent of mid-May, as green ashes, American basswoods, paper birches, and even some maples have leafed out well before their usual May time frames. The big question on everyone’s mind, of course, is why. Is it global warming? El niño? An aberrant spring? I wish I knew the exact answer, but at this point I’m willing to bet that all three have something to do with this spring’s temperatures. Crabapples blooming in front of Interpretive Center, 4/21/10. The picture of flowers look awesome. That is just an incredible combination of textures and elements. So softly feminine, and intricate. Beautiful!